I spent a full month in Morocco, exploring as much of it as I could. From the souks of Marrakesh to the camels in M’Hamid and everything in between, my experiences in the country were ones that still bring a smile to my face. I drove from Marrakesh to the desert, ate just about every tagine I could find in the country — my guide to tagine is here — and reveled in the beautiful architecture and elegant tile work. The photos in this guide are from my month in Morocco. As you can see, it’s a beautiful place! Of course, being celiac, I also had to content with food. Specifically, it was in Morocco that I foolishly realized I was misinformed about semolina. I was told back in Canada that it was not a wheat derivative. Of course it is! I left without double checking, and realized quickly how mistaken I was. This is why I tell celiacs to make sure, for their own peace of mind and for their stomaches, that they familiarize themselves with ingredients used in the country. As a result of this mishap, I became a lot more serious about researching all of the ingredients in a country’s national dishes. I can thank Morocco for seeding me with the beginnings of what bloomed into this celiac restaurant card project. According to Jeff Koehler, in his book Morocco: A Culinary Journey with Recipes from the Spice-Scented Markets of Marrakech to the Date-Filled Oasis of Zagora, barley is thought to be the ‘original’ couscous grain, grown prior to the introduction of hard durum wheat. So it isn’t simply wheat and durum wheat that are found in Morocco today. What is Safe and Gluten Free in Morocco? What is Unsafe for a Celiac in Morocco? For starters, this detailed gluten free restaurant card will help communicate your eating restrictions, and allow you to understand what is safe and unsafe from the menu. 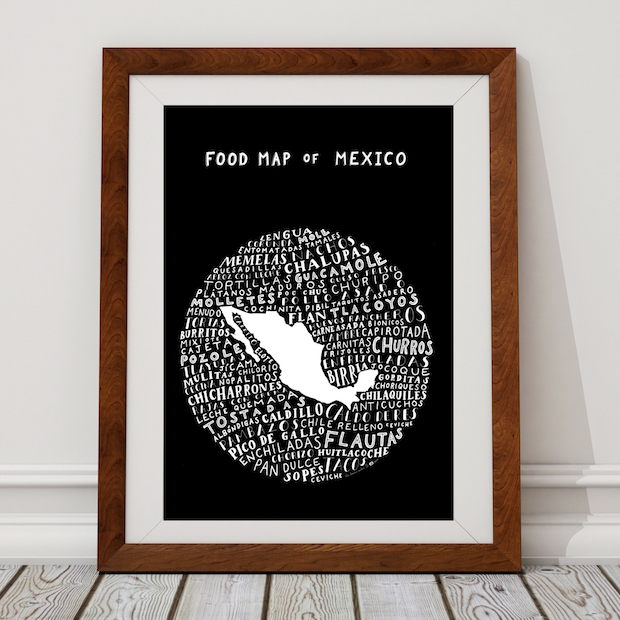 The card was created with celiac-specific research, mention of cross contamination, and a double checked translation from locals who speak the language. The food names and dishes within the card are also double checked for accuracy with different regions in Morocco. 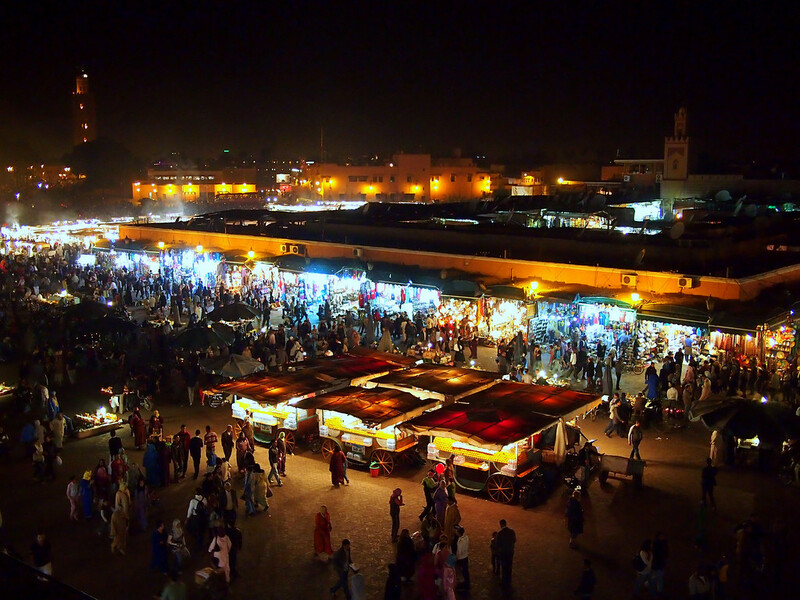 While French is also spoken in Morocco, the recommendation was to translate it into Moroccan Darija (also known as Moroccan Arabic), a Maghrebi Arabic language spoken in Morocco. 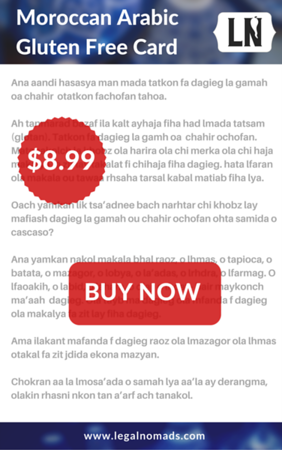 For ease of ordering, I have also included the basics below in this guide — in both French and Moroccan Arabic. A big thanks for translating skills to Amanda and her husband — he has celiac disease, and they are both living in Morocco, and to Yacine, my second translator for this card. The following dishes are commonly wheat-free in morocco, as confirmed by translators. 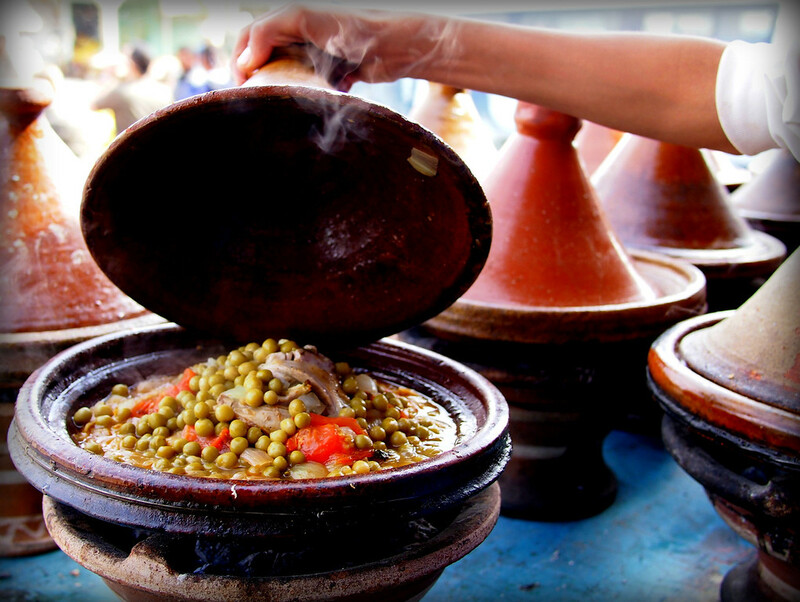 Likely Morocco’s most famous dish, tagine (or tajine) is the name for both the stew and the dish it’s made in. Tagine is traditionally made of meats and vegetables slow cooked over coals or a stove in a conical clay pot for many hours. Different varieties contain beef, chicken, lamb, or fish with vegetables and sometimes dried fruits and nuts. Tagines are naturally gluten free, but are a communal dish served with bread. Traditionally, the bread is used to scoop the tagine, so if you’re sharing with non-Celiacs, you’ll want to scoop your portion first to avoid cross-contamination. Tagine, steaming hot and ready to eat! Tangia, not to be confused with tagine, is a slow-cooked stew with a burst of wonderful flavors. Per Paula Wolfort in The Food of Morocco, “tangia is a dish made by men, a dish of soldiers, sheepherders, and others separated from women” – a bachelor’s dish”. It’s flavored with spices – ras-al-hanout, cumin, nutmeg, cinnamon and more – and lemon and garlic round out the tastes. Usually made with lamb or beef – and customarily gluten free. Chermoula is a marinade used to dress fish and seafood. Usually made of garlic, cumin, coriander, oil, lemon juice and salt, with variations using saffron, paprika, cayenne, and parsley. Kefta, sometimes referred to as kebab is a Moroccan meatball of minced beef or lamb, seasoned with onions, paprika, cumin, coriander, parsley and sometimes cayenne or mint. Sometimes grilled and server on a skewer, other times incorporated into tagine or sandwiches. Zaalouk is a salad made of cooked eggplant and tomato intended to be eaten as a dip. Like most Moroccan salads, this one is naturally gluten free. Khlii or Khlea is a preserved meat or jerky, typically made from beef or lamb that’s been cut into strips, marinated and sun-dried before being cooked and stored in animal fat. Often chopped into small pieces and served with eggs in an omelette, or with beans or lentils. Omelettes, including of the Khlii variety, are often prepared in a tagine and should be safe to eat, making them a good substitute to a typical Moroccan breakfast of bread and pastries. Shakshuka, a delicious breakfast dish often seen in the Middle East, is also found occasionally in Morocco. It consists of eggs poached in tomatoes, onions and peppers. Kalinti is a savoury dish made from chickpea flour and egg. Described as similar to a flan or a quiche, it’s often sold hot by the slice as a street food. Made from pureed dried fava beans, bessara can be served as a dip or a soup, depending on consistency. Served warm, it’s a popular winter dish. Harissa, a hot chilli pepper paste made primarily from a variety of peppers and seasoned, is safe for celiacs. Depending upon the region, it can be made with garlic, coriander, saffron, cumin, lemon or caraway. It’s used a condiment, as well as a base for stews or seasoning for meats or couscous, in North African countries. Raib is an easy, safe snack: yogurt, often served with fruit. 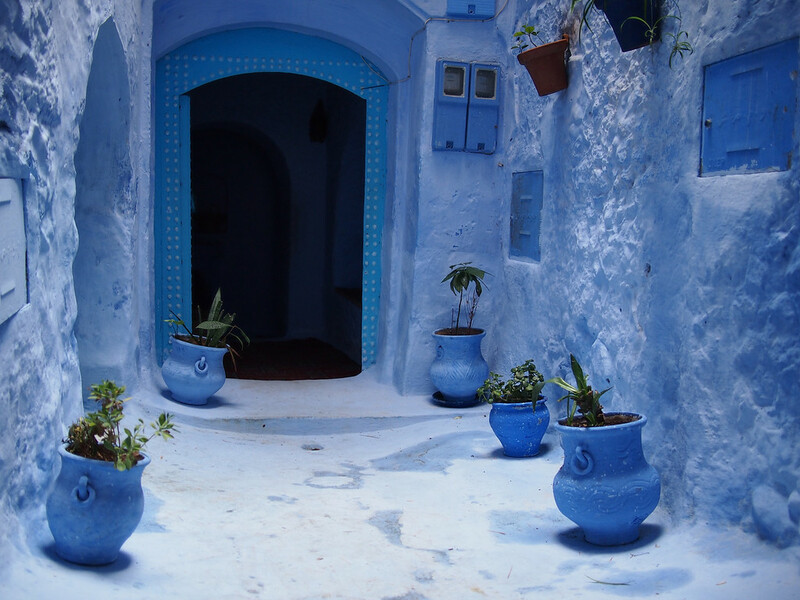 Exploring Chefchaouen, Morocco’s blue pearl. Carrefour – Like many of the large supermarkets, Carrefour has a small “Free-From” section with some imported gluten free products. Carrefour Diététique is a health food shop Casablanca with quite a few gluten free options. 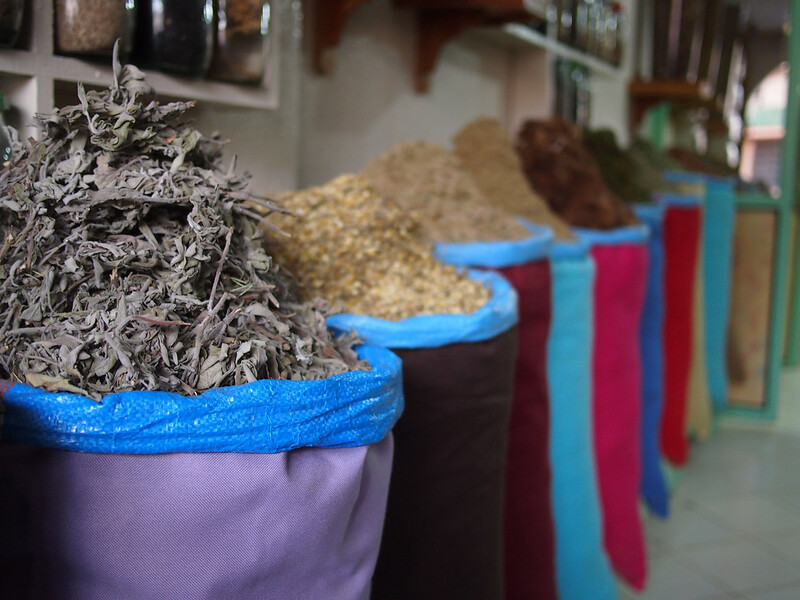 Naturia Bio Shop is another health food shop in Marrakesh carrying some gluten free items. 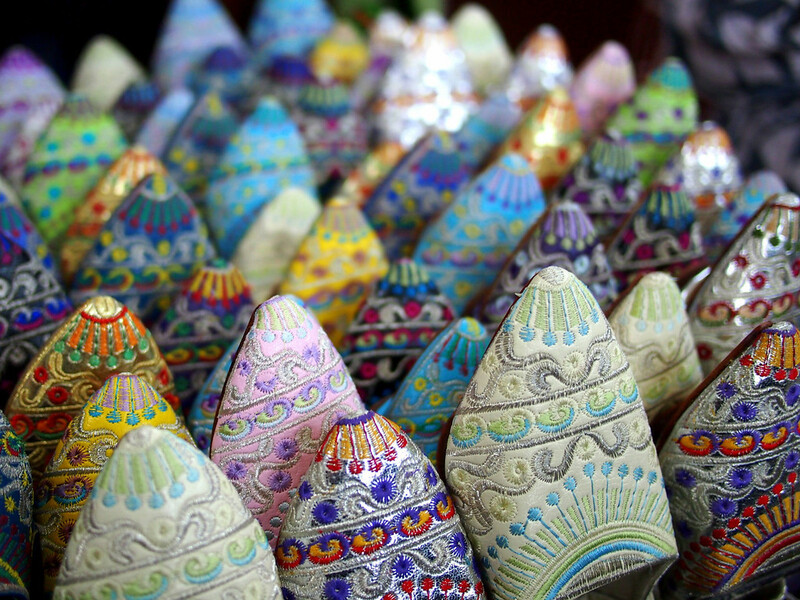 Babouches, slippers from Morocco, for sale in Fez. 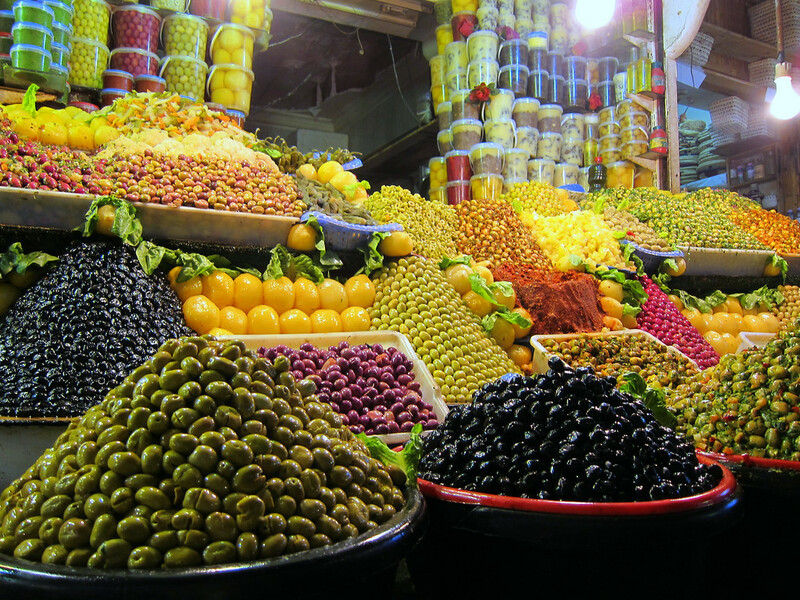 Marketplaces, called souks, will have stalls with fresh and dried fruit and nuts for snacks, as well as vegetables, olives, meat and fish. Olives for everyone in Meknes. When buying products and ordering, the following list may be helpful to decipher ingredients. Moroccan Arabic: translators both said not v. much used in Morocco as an ingredient, and chaâir below sometimes used for both rye and barley. Given the use of barley for centuries, it makes sense that it would be the dominant word of the two. Amanda at Maroc Mama recommends La Creperie du Marrakech 14 Petit Marche de Gueliz, Route de Targa, Marrakesh as it has pure buckwheat crepes that are safe for celiacs! Pepenero in Marrakesh not only has a lengthly menu but items are specifically noted as gluten free. It’s an Italian spot, not Moroccan, but it is a comfort to know we don’t need to explain the disease! It’s also located in a gorgeous courtyard setting, great for outdoor eating. For higher-end, readers also wrote in about the Mamounia Hotel’s on-site restaurants, saying that the hotel was knowledgeable about the disease and able to serve them safe meals. L’Atelier Cuisine in Marrakesh was recommended by several celiac readers as offering health food products and dishes that are strictly gluten free. For specifics in Essaouira, Morocco, check out Maroc Mama’s guide here. 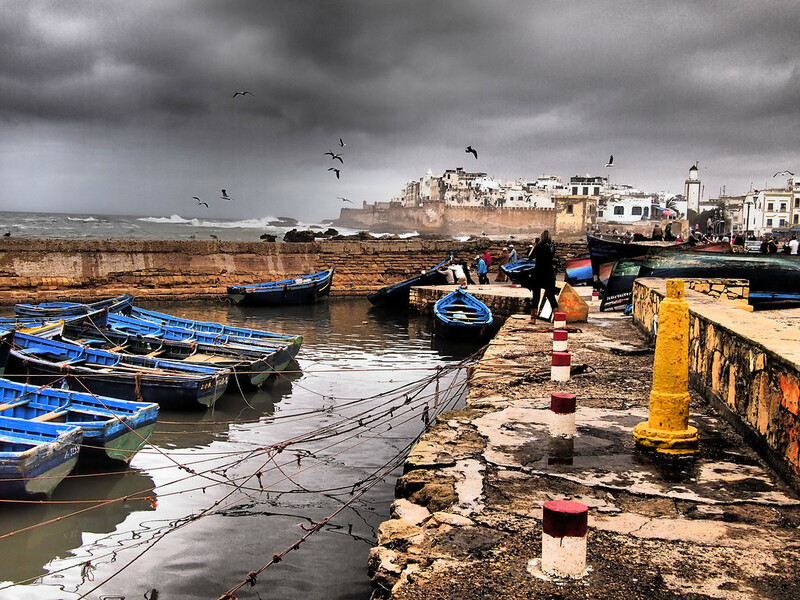 Essaouira on a stormy day. 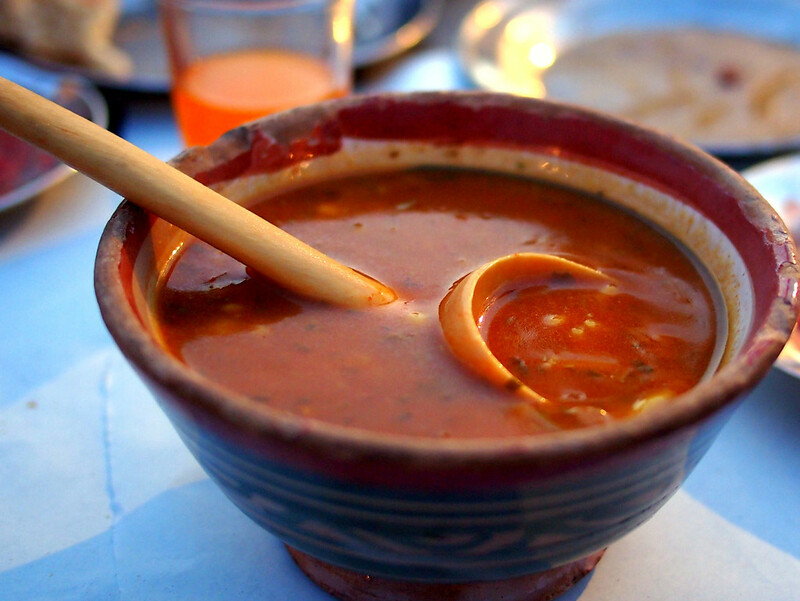 Harira is a staple food in Morocco, especially during Ramadan, but sadly, the soup often contains pasta and is thickened with flour. I did find several that were made without either, but it is important to ask. Maakouda are potato cakes made with flour and popularly served as snacks and starters. Pastilla or B’stilla is an Andalusian-Moroccan meat pie originally made from fledgling pigeons, but more often made from chickens or offal these days. Dchicha is a cracked wheat soup – definitely a no-go here! Deriving its name from Spanish, the Bocadillo is a baguette sandwich often sold on the street as a snack. Popular varieties in Morocco include tuna or eggs. Ma’amoul are shortbread cookies stuffed with dates, walnuts or pistachios. Couscous is a dish of tiny, fluffy semolina pasta with meat and vegetable stew served over top. It’s always made with wheat in restaurants, but in some guesthouses (riads), it may be possible to carefully communicate with staff to arrange for cornmeal (bdez) to be used instead. 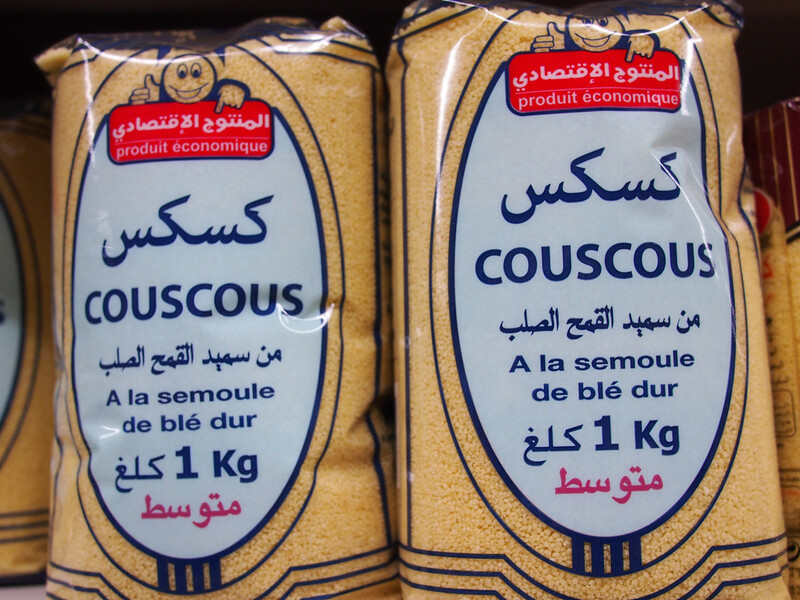 Couscous – one of many, many brands for sale. Seffa is delicate couscous steamed multiple times until it’s very pale, and then dusted with cinnamon, sugar and almonds. Served at the end of a meal or on it’s own. Harcha is a pan-fried flatbread made from semolina flour. Like other breads, including pita, it is not safe for Celiacs. For those of you looking to visit, here are some wonderful books to help learn a little more about Morocco and its food before you get there. The Caliph’s House by Tahir Shah is a brilliant account of how a writer and filmmaker left behind London life to renovate the djinn-haunted former home of the caliph of Casablanca – overflowing with insight and Moroccan characters writ large. Check out his more recent In Arabian Nights for his delving into Morocco’s rich storytelling tradition. Morocco: In the Labyrinth of Dreams and Bazaars by Walter M Weiss is an ambitious journey through the contradictions of modern Morocco from its polyglot past to its modern liberal-conservative fault lines. In The Spider’s House, Paul Bowles presents Fez in the twilight of the French occupation as the arena for this political tour de force considered by many to be Bowles’ finest. Daily Fez life, with its weblike complexities, provides a fascinating backdrop. In Arabian Nights: A Caravan of Moroccan Dreams by Tahir Shah. With one foot in the East and the other in the West, Shah’s memoir about his new home in Morocco, Dar Khalifa, and subsequent search for the teaching stories that provide a foundation of learning in the East is a captivating read. If you liked Bruce Chatwin’s The Songlines, this book will appeal to you immensely. I enjoyed every word. Couscous and Other Good Food from Morocco by Paula Wolfert was first published in 1987 and proved its staying power when it was inducted into the James Beard Cookbook Hall of Fame in 2008. The classic text of Moroccan cuisine is full of culture, history, and of course, recipes that range from couscous to pigeon pie. The good news for those who know and love the recipes in Wolfert’s original Moroccan cookbook is The Food of Morocco, her 2011 cookbook full of even more authentic recipes, as well as essays and photographs that highlight the vibrant ingredients of Moroccan cuisine. Morocco: A Culinary Journey with Recipes from the Spice-Scented Markets of Marrakech to the Date-Filled Oasis of Zagora by Jeff Koehler is a colorful journey through Morocco’s diverse landscapes and the cultural influences that mark the cuisine. Mouthwatering photography! Mourad: New Moroccan is not an ode to traditional homemade Moroccan cuisine, but rather a celebration of all that Michelin-starred chef Mourad Lahlou has created in his 20 years of cooking in San Francisco. His book takes the classics and spins them into creative modern dishes that excite the senses while preserving the integrity of traditional Moroccan flavours, textures and colors.